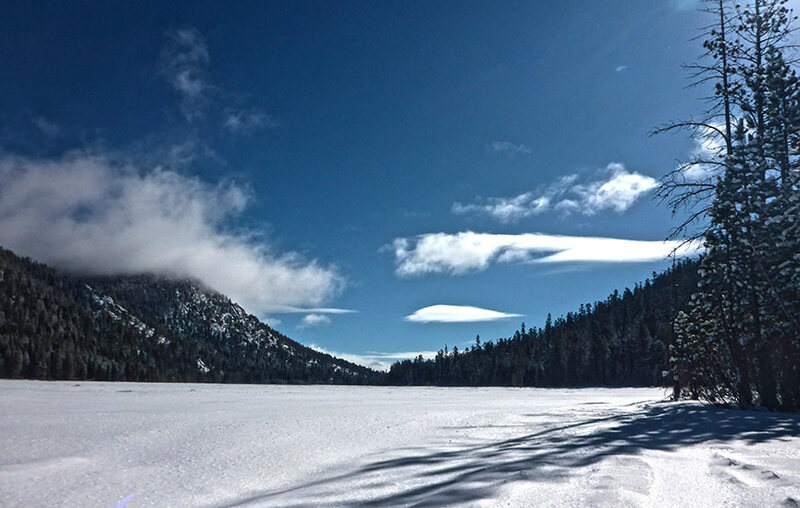 On the south shore of Lake Tahoe, Grass Lake at Luther Pass is a great location for cross-country skiing, snowshoeing, or just some fun snow play. Since Grass Lake and the immediately surrounding terrain is flat, this location is perfect for beginner cross-country skiers. Although the terrain is technically “off-track,” there’s usually opportunities to practice your diagonal striding technique thanks to all the tracks packed down by other cross-country skiers. However, be prepared to blaze your own trail if you’re the first to arrive at Grass Lake after a fresh snowfall. 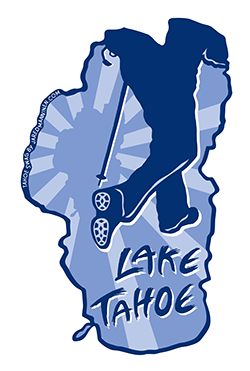 Parking is free and plentiful (at least for Lake Tahoe, anyway!). And, at an elevation of 7,735 feet, Luther Pass can hold snow longer than other areas in the Tahoe Basin. Click on the above map to enlarge it for better viewing and printing. This map is only for reference and shows the general route for cross-country skiing at Grass Lake (on Luther Pass). Your trip may look slightly different than mine based on your specific route selection. You don’t necessarily have to stay within the lines when traveling over snow! Always carry a traditional topographic map and compass when traveling in the backcountry. Here’s another route I’ve cross-country skied at Grass Lake on Luther Pass. Click to enlarge this image. Travel approximately eight miles south along SR 89, beginning at the intersection of HWYs 50/89 in Meyers, CA, to reach Luther Pass (and Grass Lake). There are multiple pullouts in which to park on the flat stretch of highway along Luther Pass that will provide access to Grass Lake. There are no signs about parking in any of these turnouts except for one spot that’s specifically dedicated for snow removal vehicles. Resist all urges to park in this area, lest you receive a ticket. Although I’ve parked in various turnouts at Luther Pass during different weather conditions and have never had any issues, I would avoid parking there on the snowiest of days. I believe law enforcement generally remains hands-off with regard to citing parking violations on Luther Pass, but on heavy snow days I imagine anything can happen. Also note that Waterhouse Peak and its sister peak to the west (which are both accessed via Luther Pass) are favorite backcountry ski and snowboard destinations. On days following big snowfalls, expect to find lots of vehicles parked along Luther Pass. I’ve never seen the turnouts so packed that you couldn’t find a spot in which to park, but just know that occasionally it can be challenging. Although the red flag on this map indicates Luther Pass proper (where you actually find the sign and elevation), there are numerous places along SR 89 to park for access to Grass Lake. The Grass Lake area at Luther Pass is essentially flat, so it’s an ideal playing (and training) ground for beginner cross-country skiers. The only real challenges at this location is whether or not the snow is deep enough to cover the ground and whether or not anyone has had a chance to pack tracks before your arrival. Grass Lake is as its name sounds … a lake mostly filled with grasses. I don’t believe there are any aspects of Grass Lake that get much deeper than 5-8 feet (?) but the whole area is marshy, so I would still avoid crossing it during low snow times. Another consideration is that if there isn’t much snow and the water hasn’t had a chance to thoroughly freeze, you run the risk of icing up the bases of your skis by skiing over wet spots. When you do this, the snow instantly freezes to your skis and creates a lot of extra work for you. The map I’ve provided below shows the longest one-way cross-country ski route at the Grass Lake area. This route travels from one end of Luther Pass to the other by contouring the base of the mountain (Waterhouse Peak), which is where you’ll find the most snow. The one-way distance is just over 2 miles, so double that (obviously) if you’re making an out-and-back cross-country ski or snowshoe trip. Two other reasons to ski this route (out-and-back) is that it’s furthest from the highway and you’ll be able to travel back over the tracks you’ve just laid. Please note, however, that so long as there’s enough snow you can ski wherever you want around Grass Lake. I’ve cross-country skied loops and have traveled directly across the lake. On big snow years, I’ve traveled higher up the mountain to practice downhill turning and climbing. I’ve zig-zagged in and out of the trees to mix it up, too. There are no rules as to where you can or can’t go. Just know that the snowpack is generally deeper closer to the mountain and thinner closer to the highway. One last consideration to be aware of with regard to cross-country skiing at Grass Lake is that the area features high exposure. The Luther Pass region surrounding Grass Lake is a large, open area that gets a lot of sun (which will reflect off of the snow into your face) and can harbor some nasty wind (chill).